Pea necrotic yellow dwarf virus (PNYDV), a member of the Nanovirus genus, has been reported from numerous European countries causing yield loss in peas, faba beans, vetches and lentils (Grigoras et al., 2010; Grigoras et al., 2014; Gaafar et al., 2016; Gaafar et al., 2017). In July and August 2016, five faba bean (Vicia faba) samples were received from five fields in different regions of Denmark, in which 2 to 25% plants were diseased. Affected plants displayed leaf-rolling, yellowing, and symptoms of severe stunting (Figs. 1-2). The samples reacted positively when analysed with ELISA using antibodies against PNYDV (Gaafar et al., 2016). DNA was extracted and PNYDV infection was confirmed by PCR using primer pairs specific for components R and S (Gaafar et al., 2017). Additionally, the full genomes of these Danish PNYDV isolates were determined. Rolling circle amplification was performed using a TempliPhiTM 100 Amplification Kit (GE Healthcare Limited, UK). Libraries were prepared from the products and submitted for high-throughput sequencing on two Illumina platforms, three samples on HiSeq (2*150) and two on MiSeq (2*301). The paired-end reads were analysed using Geneious 11.0.4 software (Biomatters Limited, NZ). The reads were trimmed, error corrected and normalised, then used for de novo assembly. Assembled contigs were compared with the GenBank non-redundant nucleotide and protein databases using BLASTn and BLASTx, respectively. The results confirmed the presence of all eight PNYDV components in all samples. Additionally, an alphasatellite 3 sequence was found associated with the DK HZ16-572 and DK HZ16-582 isolates, and a satellite DNA-X sequence was found associated with DK HZ16-572. The PNYDV genome Drohndorf-15 (Germany; GenBank Accession Nos. NC_023154 to NC_023161) was used to assemble the eight components of the Danish isolates and Austrian sequences (Gross-Enzernsdorf_1) for alphasatellite 3 and satellite DNA-X (KC979052 and KC979053, respectively) by mapping to reference. The sequences of the Danish PNYDV isolates can be accessed on GenBank (MH000227 to MH000269). A neighbour-joining tree (Jukes-Cantor genetic distance model and 1000 bootstrap replicates) was created using Geneious Tree Builder (Fig. 3) and the alignment (ClustalW 2.1) of the concatenated genome components (DNA-R, -S, -C, -M, -N, -U1, -U2 and -U4) from the Danish PNYDV isolates as well as the Austrian, Dutch and German isolates. Additionally, a pairwise comparison between the associated alphasatellite 3 of DK HZ16-572 and DK HZ16-582 showed 99% nucleotide identity to each other, and 99.1% and 99.3% identity when compared with the Gross-Enzersdorf_1 isolate, respectively. Finally, DNA-X of DK HZ16-572 shared 98.8% identity with Gross-Enzersdorf_1. 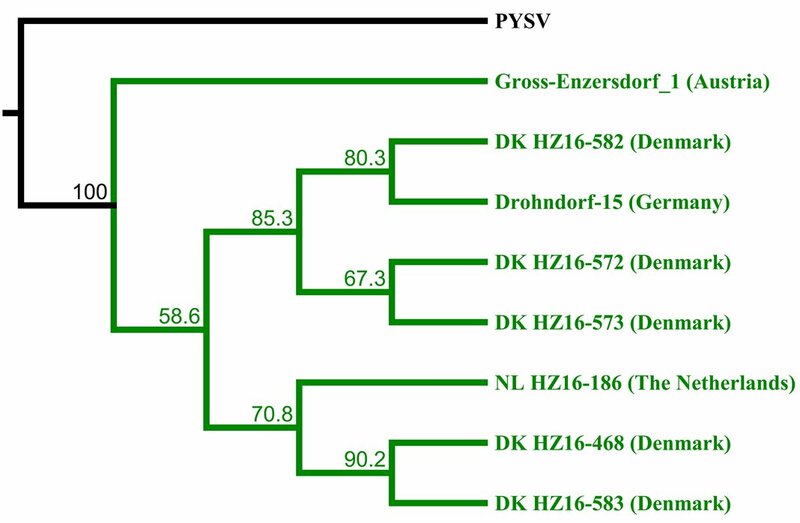 The tree and the sequence alignments indicate that the Danish isolates are very closely related to other European isolates of PNYDV. To our knowledge, this is the first report of a nanovirus disease in Denmark demonstrating that PNYDV is also widespread throughout Denmark. This is further evidence that PNYDV (and possible other nanoviruses) is an emerging threat for legumes not only in Denmark which has an increasing area of legume production (Table 1) but also in other European countries. 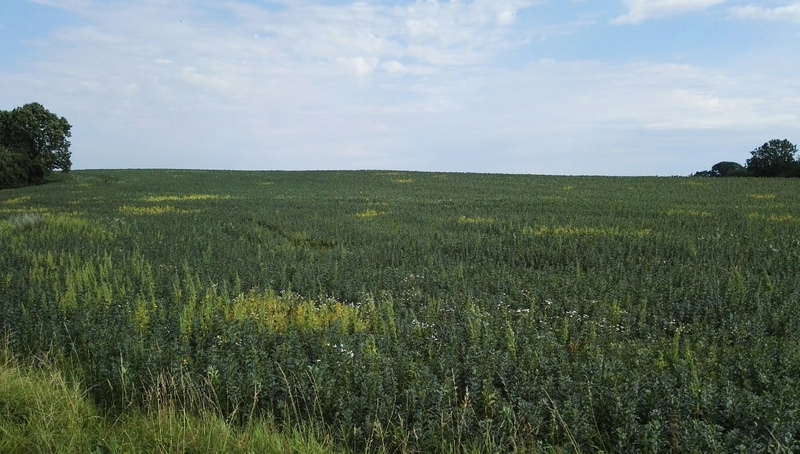 Figure 1: Symptoms of Pea necrotic yellow dwarf virus in a faba bean field near Åbenrå, Denmark (photograph courtesy Morten Steg). Figure 2: Map of Pea necrotic yellow dwarf virus-infected faba bean fields in Denmark in 2016. The coloured circles indicate the locations of the fields. The percentages represent the proportion of symptomatic plants within each field. The map was generated using MapDK (Barfort, 2015. mapDK: Maps of Denmark. R Package Version 0.3.0) and ggplot2 (Wickham, 2009. ggplot2: Elegant Graphics for Data Analysis. New York, USA: Springer-Verlag) on R 3.3.2 (R Project for Statistical Computing; https://www.r-project.org). Figure 3: Phylogenetic neighbour-joining tree representing the relationship between the concatenated genome components (DNA-R, -S, -C, -M, -N, -U1, -U2 and -U4) of Danish Pea necrotic yellow dwarf virus isolates and those from Austria (KC979043 - KC979050), Germany (NC_023154 - NC_023161) and The Netherlands (KY593279 - KY593286). Pea yellow stunt virus (PYSV) (NC_023296 - NC_023298, NC_023303 and NC_023308 - NC_023311) was used as an outgroup. The authors are thankful to the technical staff for their excellent technical support. This research was funded from the Euphresco network project (2015-F-172). Y. Gaafar was supported by the German Egyptian Research Long-Term Scholarship.